What intrigued me even more about the death certificate was the mention of an Inquest Pending, and the cause of death “Shock from being run over by automobile“. One has to remember, this was back in 1907. Commercial production of the automobile in the United States began at the beginning of the 1900’s. This had to have been an unusual case. After doing further research and finding two newspaper articles regarding this incident, it became clear the circumstances of this incident. The headlines of the paper read “SHOCK CAUSED DEATH Margaret Piatt was victim of auto. Young Woman Makes Fifth Whose Lives Have Been Sacrificed to Speeding Machines.” An inquest was scheduled and a jury empaneled to hear the evidence in the case. “Something should and can be done to stop the slaughter of persons by reckless automobilists” states the Prosecutor. On July 4, 1907, a jury heard evidence regarding the incident. Apparently a sightseeing auto was driving along the street when Margaret stepped out in front of it. She sustained “fractures of both bones of the lower right leg and that both the right and left femurs were broken, the former being a compound fracture. Death occurred due to those injuries and the shock.” One witness stated that no warning signal was given by the auto…but another witness stated that Margaret “became confused and the cause of the accident was from her own carelessness.” There was a dispute as to how fast the car was traveling with some witnesses says between six to eight mph and others saying twelve to fifteen. Therefore, according to the article, the differences confused the Coroner’s Jury and no responsibility was fixed. No further action was taken against the driver. I am so thrilled to have been able to find this information, all online! I only wish I could have found this our before my father passed away in 2010…I am sure he would have loved to learn the true facts surrounding Maggie’s death. 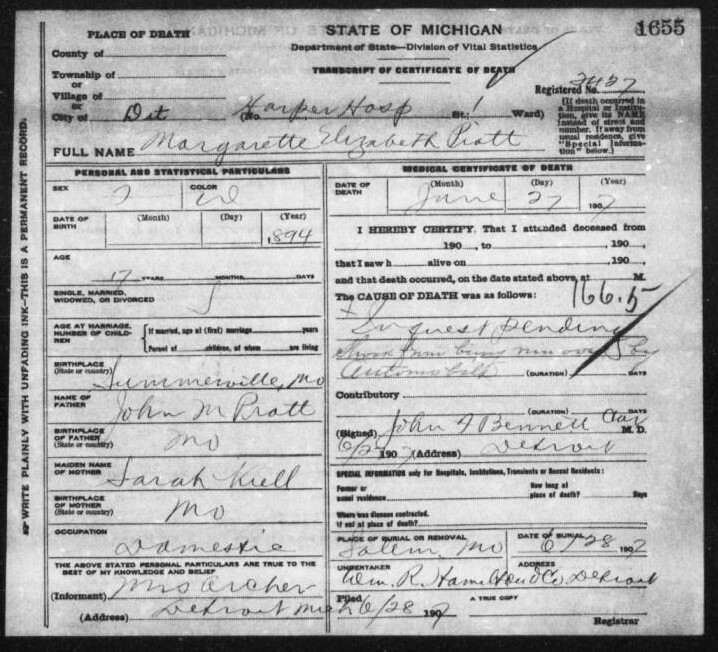 There is also a mention of a Mrs. Mary Archer, both on the death certificate and in the newspaper articles, who is said to be Margaret’s aunt. This name is unfamiliar to me in my research…so looks like another mystery that needs to be solved!